Harry McCool, DDS now offers advanced dental care with the BIOLASE WaterLase iPlus 2.0™ system. This minimally invasive laser technology allows the dentist in Lilburn, GA to provide his patients with virtually pain-free treatments that are more effective than traditional methods. 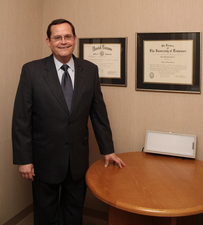 Dr. Harry McCool is pleased to announce the availability of state-of-the-art laser dentistry at his practice. In Lilburn, GA, dentist Dr. McCool performs a variety of restorative and cosmetic dental procedures using the BIOLASE WaterLase iPlus 2.0™ system. A beam of light energy targets and removes harmful bacteria without damaging healthy tissues, and the laser is so gentle, many people do not even require anesthetic. Gum disease and cavities begin with the buildup of plaque, a substance consisting of bacteria and food acid. This hardens around the base of teeth and below the gum line, and if it is not removed with good oral hygiene practices, it leads to infection. A typical dentist in Lilburn, GA treats these issues with sharp metal instruments that can cause a person as much pain as the decay. Rather than cutting and scraping the area or drilling the affected portion of the tooth, Dr. McCool uses the minimally invasive BIOLASE WaterLase iPlus 2.0™ laser to eliminate bacteria and decayed tissues. In addition to cleaning and disinfecting, the laser strengthens the integrity of fillings by curing the bonding material, and it also activates tooth whitening gels for patients seeking a brighter smile. When used for soft tissue procedures, the BIOLASE WaterLase iPlus 2.0™ laser minimizes bleeding and swelling, so the pain and discomfort that often follow a visit to the dentist are not a problem. The gums are more likely to fully reattach to the roots of teeth after a periodontal treatment because the laser stimulates healthy connective tissue regeneration. This reduces the likelihood of issues such as gum recession, which leads to root sensitivity and an altered smile appearance. Since it vaporizes harmful tissue, the laser can also be used to remove lesions. There is little or no bleeding during these procedures, and no cuts or stitches are necessary. Shorter dental visits, minimal pain or discomfort, more effective treatments and rapid recovery times are all hallmarks of procedures performed with the BIOLASE WaterLase iPlus 2.0™ system. Anyone seeking a dentist in Lilburn, GA can learn more about the benefits of laser dentistry on Dr. McCool’s website. Dr. Harry McCool is a prosthodontist and restorative dentist offering personalized dental care for patients in Lilburn GA. Dr. McCool and his team provide a wide range of services and are committed to high quality, professional care through the use of laser dentistry and other advanced techniques. To learn more about the services offered by Dr. McCool please visit his website at http://www.dentistoflilburn.com or call (770) 450-4407 to schedule an appointment.